We are Nadcap approved heat treaters and we work with some of the most innovative manufacturers on the planet. Nadcap is an industry-managed quality assessment program organized by the Performance Review Institute. It is a very important standard that our customers rely upon to maintain quality manufacturing processes. Nadcap accreditation audits are typically required each year. 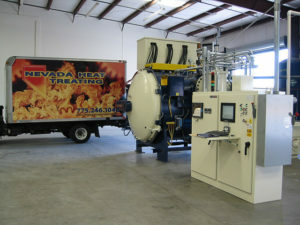 Upon it’s last audit, Nevada Heat Treating received Nadcap accreditation for 24 months: 12 months + 12 month merit. This was due to the plants ability to demonstrate a high conformance to Nadcap’s requirements. Nadcap is an industry-managed quality assessment program organized by the Performance Review Institute. It is a very important standard that our customers rely upon to maintain quality manufacturing processes. Go to the Nadcap page for more information. AS9100D is a standardized quality management system for the aerospace industry. Major aerospace manufacturers and suppliers worldwide require their manufacturing vendors to be AS9100 compliant in order to do business. Having a global standard for quality and processes allows OEMs to use vendors from around the world who all meet the same rigorous standards.